Gym Management Software designed to streamline, automate, and improve your business operations. No matter if you are big or small. 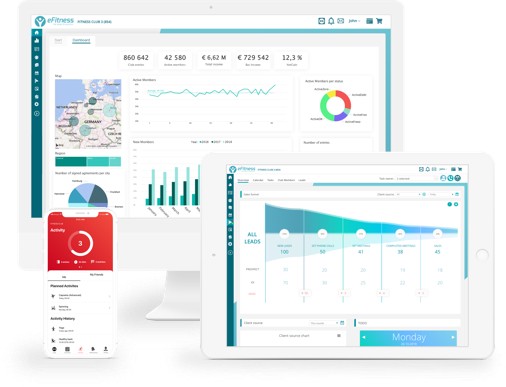 Beautifully designed dashboards that paint x-ray picture for you to know instantly the health of your business. Analyze your data by club, region, or country. Spot trends and act on them quickly. Mesure your marketing campaign ROI. Customer Relationship Membership module designed to close deals faster. One streamlined view of your sales process helps your team to stay focused on their next most important task. Leverage automation to save time on repetitive tasks. All the resources necessary to help you and your team sell more. Let members sweat during a workout, not when they buy their membership. Use the Member Area which is optimised for conversion and allows your customers to easily buy memberships, add extra services, and manage their account. Automate your marketing and processes. Mobile application that extends your business. Integrate digital technologies with in-club hardware to create a seamless experience for your members. Secure payments with leading payment providers to give you the flexibility and convenience you want. Your team deserve to use great tools! We have been working with eFitness soon after opening our first club. So you could say that we grew with eFitness and eFitness grew with us. Now, 69 clubs later it is clear why we have chosen eFitness as our software provider. Their modern software and their continuing improvements of the HelpDesk allows us quickly solve any operational issues. eFitness has never been afraid to challenge some of our software requests and has always proposed simpler and more practical solutions, which at the end of the day provides us with a quick and responsive tool that aides us in the expansion of our business. The implementation of eFitness in the Czech Republic was one of the most difficult projects our operations team had to face. Without the eFitness specialists supporting our Czech team, unification of the system throughout our chain and the replacement of several independent operating systems into one would not have been successful. And this is just the beginning of cooperation. Having such a professional partner, I believe that we will soon be able to introduce all of the new eFitness solutions on the Czech market. Thank you for the professional system implementation. eFitness is a cost-effective software solution that easily scales as a business grows. What we like the most are its reporting capabilities, which constantly supports us in our implementation of various strategic decisions. Building and managing a growing portfolio of 149 clubs in multiple countries is a challenging task. On one hand, you want to be at the forefront of technology and at the same time you need a stable and scalable solution in place. That is why we have chosen eFitness sp. z o.o. and eFitness software to manage and operate our clubs. It gives us the tools we need for our daily operation with powerful reporting, automation and whole online ecosystem for members. What we like about eFitness is that they try to understand the challenges we are facing from the club operations perspective and then propose a solution. Thanks to this we are getting management software that helps us optimize our processes and efficiently manage our chain.